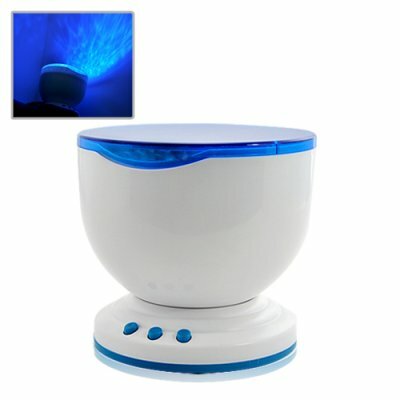 Successfully Added Dream Wave - LED Ocean Wave Effects Projector with Speaker to your Shopping Cart. Transform any room into a peaceful and relaxing environment with this LED ocean wave effects projector. This amazing little device projects subtle and relaxing blue waves that mimic the motion of waves in the ocean. This is the perfect way to create a peaceful and calming environment after a long day of work, or a great way to add a little romance to your night life! This cool gadget also features a 3.5mm audio jack and built in speaker for enjoying your favorite songs directly from your MP3 player. Just imagine. You get home after a long and stressful day at work. You dim the lights then play some Bob Marley to set the mood while lying back in your lazy chair and smoking from your favorite peace pipe. The relaxing rhythm of blue waves covers the room and next thing you know your thoughts, stress and tension beings to disappear. Your mind and body are now deeply relaxed and one hour later you’re refreshed, full of energy and ready for the world. Life is complex and often stressful. But it doesn’t need to be that way. Take control today by ordering this mood enhancing LED wave effects projector and start enjoying the peace and tranquility you truly deserve. And if your friends or family are feeling the pressure of life then don’t forget about them either. The Dream Wave is available right now for about 50% less than anywhere else online, ships directly from our warehouse within 24 hours, and even includes a full 12 month warranty. For best results use this device in a dark or dimply lit room. Can I connect this device to my iPod? Sure can. You can connect this device with any audio device that has a 3.5mm audio jack.